You bought a boat. Now how do you maintain it? Just keep the following three points in mind, and the first year with a new boat should be smooth sailing. First off, engines, steering equipment, water pumps and anything else aboard that moves will benefit from use. Turn everything on and use it at least a couple of times a season. Raise and lower your anchor at the dock, for instance, if you never anchor out. Turn on a seldom-used air conditioner for at least 10 minutes every week or two. Let your circuit-breaker panel and the switches at the helm be your guide to be sure you don’t miss anything. This also ensures that everything is in working order if you ever need it. Next, keep it clean. This isn’t just aesthetic. If the engine space is clean, you’ll see an engine-coolant or steering-fluid leak right away, so you can have it taken care of before it gets worse. Debris in the waterways around deck hatches can clog drains. Then when it rains, if the water can’t drain, it finds its way into that hatch, and sometimes onto equipment that shouldn’t get wet. When you notice a bit of metal looking rusty or dull, take five minutes to polish it with wax that protects stainless steel and aluminum and cleans minor corrosion before it permanently etches into the finish. That time pays off at the dock, when your boat sparkles brighter than your neighbors’. And finally, the adage a stitch in time saves nine holds particularly true on boats. If you notice fluid leaking or salt deposits forming anywhere in the engine space, for instance, take care of those small things when you see them to avoid a bigger job to work on later. Use more than your eyes too. As you spend time aboard your boat, you’ll learn what noises and vibrations are normal. Pay attention when anything seems different, since that is often the first indicator of something amiss. Engines: In cold climates, winterize engines every fall to protect cooling systems where water might be trapped and freeze. At the same time, treat engine inner workings with fogging oil to prevent corrosion. Except for a few outboards, engines require an oil change, along with new oil and fuel filters, every year. Annual service also includes a comprehensive, though fairly simple, list of places to lubricate and inspect. Engine-cooling pump impellers last for two or three years, but change them more frequently if you often operate or dock in shallow, silty water, which abrades rubber impellers. Underwater paint and hardware: Change sterndrive or outboard gear-case oil every fall, or at least check for water intrusion while winterizing the engine. Send propellers with more than a couple of minor nicks to the prop shop to be reconditioned. The paint on your boat’s bottom prevents marine growth, such as barnacles and sea grass, but its effectiveness varies by paint type, climate, region and even local water bodies. Ask around, but expect to repaint the boat’s bottom every one to three years. Unpainted metal anodes attached to sterndrives or inboard prop shafts and rudders are there to prevent corrosion. Replace them when they’re 50 percent deteriorated. Batteries and electrical systems: Maintenance-free batteries should last for three years or more. Never ignore a hard-to-start engine, though, as even brand-new batteries occasionally fail. Fully charge batteries after each trip and before winter or prolonged storage, and have batteries load-tested every spring—a simple procedure done aboard the boat. Immediately address any signs of water dripping onto electrical panels or junctions, and don’t store gear where it might damage wiring. Fiberglass: Rinse your boat thoroughly after each outing, and wash it once a week with mild boat soap—one that won’t remove wax. Southern latitudes and saltwater boating require wax as often as every two months from the main deck up. Northern and freshwater boaters might wax only once a season. You’ll know it’s time when grime becomes harder to wash off the boat. Between wax jobs, use a cleaner wax—which scours the dirt but also leaves behind a protective wax coating—to quickly touch up trouble spots. Canvas and upholstery: Polyester or acrylic fabric covers and sunshades need just a good freshwater rinse, plus an occasional light scrub with Woolite or natural-soap flakes. Once or twice a season, rejuvenate stain and water repellency with fabric sealer. Use only manufacturer-approved cleaners on windowlike clear panels. Wash cushions with mild boat soap to remove sunscreen, food crumbs and dirt, and deep-clean and protect the fabric as needed with vinyl cleaner and protectant. Store cushions on their edge when you’re not using the boat so they dry inside and out. Teak decks, wood trim and metal hardware: Wax is the best protectant and cleaner for metal, particularly aluminum. Whatever you choose—spanning bright, glossy varnished trim to just soap and water on teak, letting its natural oil protect the wood—stay on top of it. Stripping old varnish once it starts to crack and peel is expensive, but a coat of varnish midseason, as soon as the finish dulls noticeably, is a quick, simple job. Ignoring and then revitalizing teak also shortens its life. Interior: Use only recommended cleaning products aboard—many boats use plastic vanity mirrors, for instance, which are damaged by alcohol in household glass cleaners. Water dripping from leaking hardware on deck can be hard to see, but if you find that one particular storage compartment smells musty, look around that area with a flashlight the next time you’re aboard during a rain shower. Some water invariably finds its way into the boat, which collects in the bottom of the hull, or the bilge, in nautical terms. Bilge pumps keep that water level low, but there is always a bit of water left that can’t be pumped out. Add biodegradable bilge cleaner wherever that water collects to keep the boat smelling fresh. Air-conditioning systems: If your boat has air conditioning, consider using the dehumidifier mode while you’re not aboard, but only if you’re able to check on the boat every day or two. Clear debris from air conditioner’s seawater-plumbing strainers at least weekly, or anytime the air conditioner’s cooling-water stream coming out of the side of the boat seems to be weaker than normal. Clean the return-air filters in the cabin monthly. Most air-conditioner problems stem from poor seawater flow, so inspect pumps and plumbing a few times each season. Owner’s manuals for each onboard system include maintenance schedules. When in doubt, ask a pro. 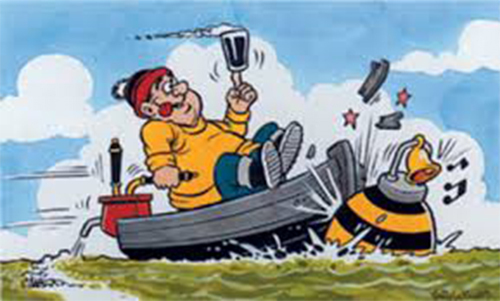 Advice from other boaters is well-intentioned but not always correct for your boat. The boat dealer, or anyone who repairs boats for a living, is a much better source. May 10, 2018 in Fun on the Water, General Information, Maintenance, Tips & Tools. 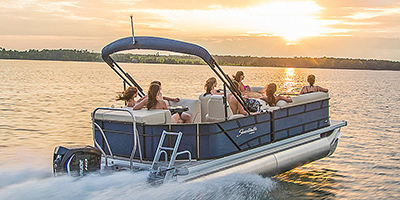 Pontoon Boats more than a party barge.